It was in 1966 that Bristol Commercial Vehicles produced two 33ft long prototype rear engine double deck buses with ECW bus bodywork known as the Bristol VRLSL. In 1968 they were joined by a 36ft variant, a VRLLH6G with coach bodywork, operated by Standerwick who numbered it 50 (FCK 450K) in their fleet. Later in 1971/2 a further 29 VRL coaches were supplied to Standerwick for their high profile express services from the north west of England to London. The subject of the first part of our programme is Standerwick 60 (LRN 60J), a VRLLH6L coach supplied to Standerwick in March 1971. 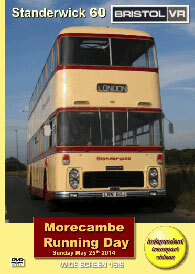 This coach has been restored to a very high standard by its then owner, Les Scott. We join the coach at the MTT depot at Burscough, near Liverpool where it was based in September 2012 when our filming took place. Les took the independent transport videos cameras out for a special trip around the Skelmersdale area and along the M58 motorway to try and recreate the journeys the coach would have made along the M6 and M1 on its way to and from London in the early 1970s. You can enjoy the sights from the smart Eastern Coachworks bodywork as we travel along the motorway and admire the coachwork as drive along the deserted roads of the Skelmersdale industrial parks. The sounds of the Leyland O680 engine are clearly heard on our tour. The coach is now in the ownership of the Ribble Vehicle Preservation Group, and it is to this organisation we move to for their Morecambe Running Day that took place on Sunday May 25th 2014. Our filming starts at the Winter Gardens on Morecambe sea front early in the morning as the vehicles arrive to take up their duties or take their place in the display. Notable arrivals are the Ribble Leyland Cheetah, built in 1936 with Brush bodywork 1568 (RN 7824) and the Leyland Lion built in 1931 number 1161 (CK 4518). Our first ride of the day is on board Bristol RESL6L 338 (NCK 338J) to Heysham village and back where we then sample former Morecambe & Heysham Corporation 69 (LTF 254), an AEC Regent III with Park Royal bodywork on the ‘Bare Circular’. Further rides are on Preston Corporation 204 (HCK 204G), a Leyland Panther with MCW bodywork to Carnforth where we film some action before returning on Stagecoach Ribble liveried 2186 (G186 JHG), an Alexander RL bodied Leyland Olympian. More filming takes place at the Winter Gardens before we board MCW bodied Leyland Titan PD3, 1775 (RCK 920) for a journey to Heysham village and back to Morecambe Winter Gardens to see further departures. This was a brilliant event, we would like to say a big thank you to the Ribble Vehicle Preservation Group for organising the day. We hope you enjoy our programme!